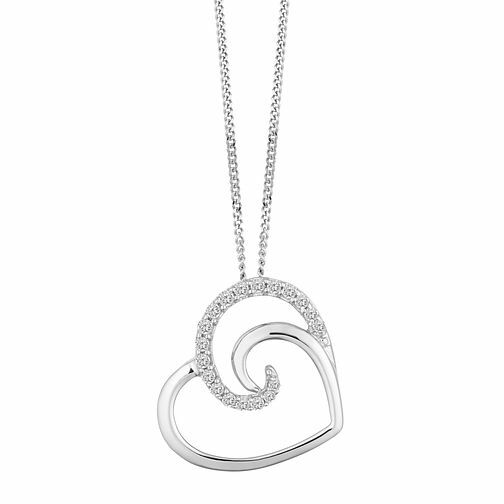 A gorgeous and glamorous pendant, this stunning piece is created from 9ct white gold and crafted to present a heart with curved detailings. Embellished with dazzling 0.10ct diamonds, this pendant is sure to steal the heart of the wearer. A beautiful design ideal for gifting to a loved one or treating yourself to! 9ct White Gold 0.10ct Diamond Heart Pendant is rated 3.7 out of 5 by 7. Rated 4 out of 5 by Anonymous from This heart was beatifully set and a lovely piece overal. Heart lovely but chain very this and had to be replaced immediately. Good value....but next time get a better chain.It detracted from the effect,and cost me an extra £40 to purchase.